Stephen Hawking changed our perception of black holes and the Big Bang. Here’s how he changed my life. Stephen Hawking overcame the loss of his working limbs and voice to become the best-known theoretical physicist of his era, upending the scientific consensus that nothing escapes the intense gravity of black holes. Earning countless honors, he used his fame to appeal for saving the Earth. Science correspondent Miles O’Brien joins Hari Sreenivasan to remember Hawking, who died Wednesday at 76. 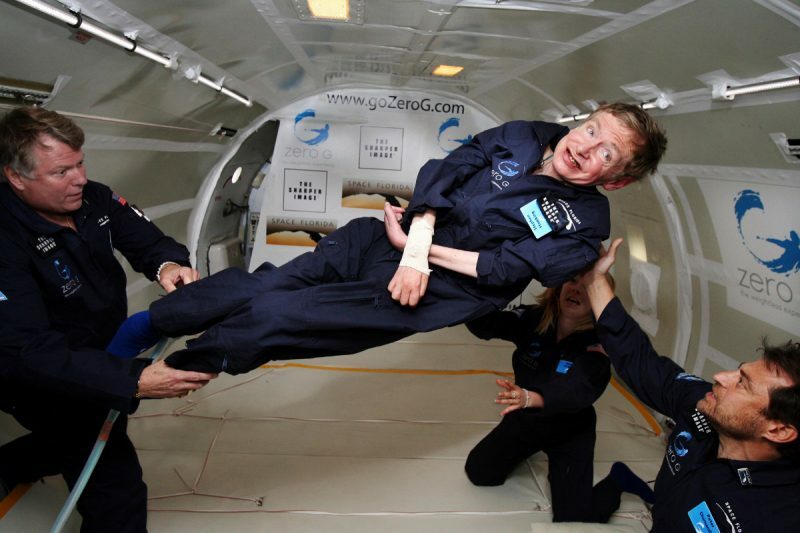 Let’s take some time now to get a fuller look at the life and work of Stephen Hawking. The British physicist pressed on in the face of adversity to become, some say, one of the most important scientists in history. Hari Sreenivasan will talk about this with Miles O’Brien. But Miles begins with this appreciation, which is, naturally, the focus of this week’s segment on the Leading Edge of science. His was a brilliant mind in a severely damaged body. Stephen Hawking overcame the loss of working limbs, and his own voice, to become the best known theoretical physicist of his era. Although my body is very limited, my mind is free to explore the universe, to go back to the beginning of time and into black holes. There are no limits to the human spirit. Hawking first gained renown in 1974, upending the scientific consensus that nothing escapes the intense gravity of black holes. Brian Greene is a professor of physics at Columbia University. Hawking came along and melded the laws of quantum physics into the previous analysis, which had left out quantum mechanics, and came to the shocking realizing that black holes were not completely black, that things could get out. They could leak a small amount of energy, a small amount of radiation. And that way, we finally recognized that perhaps the word black is wrong when it comes to black holes. They’re not black at all. In time, Hawking’s appeal spread beyond fellow scientists to the general public. His book “A Brief History of Time” first published in 1988 became an international bestseller. All the while, he battled amyotrophic lateral sclerosis, ALS, a motor neuron disease that slowly erodes muscle control. He was diagnosed at 21, and doctors gave him less than three years to live. But Hawking inexplicably defied the odds, living more than 50 years with the disease, much of it confined to a wheelchair. It’s an honor and a privilege to meet you, sir. He used his fame to appeal for saving the Earth. I want to proclaim the message loud and wide, we need to look after the planet. If we don’t, the human race won’t survive the next thousand years. In the 2014 film “The Theory of Everything,” Hawking was portrayed by Eddie Redmayne, who won an Oscar for the role. That same year, the scientist spoke to the crew of the International Space Station, recalling a flight on a special jet that, for brief moments, rendered him weightless. For me, this was true freedom. People who know me well say that my smile was the biggest they’d ever seen. I was Superman for those few minutes. The sum of his achievements earned him countless honors, including the Presidential Medal of Freedom in 2009. Hawking’s passing was marked the world over today. In London, British Prime Minister Theresa May offered her condolence. And, in Cambridge, where Hawking lived and worked, the university lowered its flags to half-staff, while students and locals recalled his many contributions. He never let his motor neuron disease hold him back. I think he’s just an inspiration generally to all, whether they be scientists or not, whether they are young or old, whether they are able-bodied or not. I think, just generally, he was a great inspiration to everyone. His legacy lives on in his science. Again, Brian Greene. It’s kind of amazing that Steven Hawking was born 300 years after the death of Galileo to the day, and he died on Einstein’s birthday. And, indeed, those are both fitting individuals, because Hawking ranks among them in the pantheon of the greatest visionary thinkers that science has ever known. Stephen Hawking died at his home in Cambridge. He was 76 years old. Miles, put this in perspective for us. How much did he contribute to our understanding of the universe? You know, Hari, he painted with that really broad canvas. He was able to connect really big things, the expansion of the universe — What gets bigger than that? — with quantum mechanics, the smallest things we know. When he was studying black holes, he was able to determine that tiny particles actually came out of black holes. Previously, scientists believed there was nothing that could escape from a black hole. This fundamentally changed the understanding of how black holes work and, if you kind of rewind the formula and do it backwards, gave us greater understanding into the origins of the universe, the Big Bang, and its expansion. So there were keen insights right there, and it showed what range he had. This is also someone who contributed to our kind of public imagination, in a way where people that weren’t thinking about black holes started to. You could put him in the category of a Carl Sagan, for example, a scientist with a good portfolio and a good resume of science, but also had a knack for connecting with the public, really against all odds, when you think about it. But he was able to resonate with people in ways that I think we’re just now coming to terms with and understanding as we think about his life. You also mentioned how broad his interests were. There were other causes later in his life that he started becoming public and famous about. Well, among the things he was interested in was the rise of artificial intelligence and robots and the concerns he had that, as we sort of cede control to machines, human beings have to find a way to make sure they stay in the loop and keep control over all this. He, along with Elon Musk, issued warnings on that front. The other area that he was very passionate about was space travel, not just an adventure. He firmly believed that human beings had to think about becoming extra-Earth species, move out beyond Earth and move into the solar system. That was an important thing, in his view. We were talking about this off-camera, but can you just talk a little bit about just the fact of what kind of inspiration he’s been to humanity at large, but specifically to the disabled community? Well, what an example to the disabled community, just by virtue of the fact that a human being who could barely move a muscle, who could not speak on his own became such a powerful communicator. What an example that is to the world about what disability really means, and what the real abilities are inside the human mind, and what a person can do if they’re not willing to accept limitations which society puts upon them. 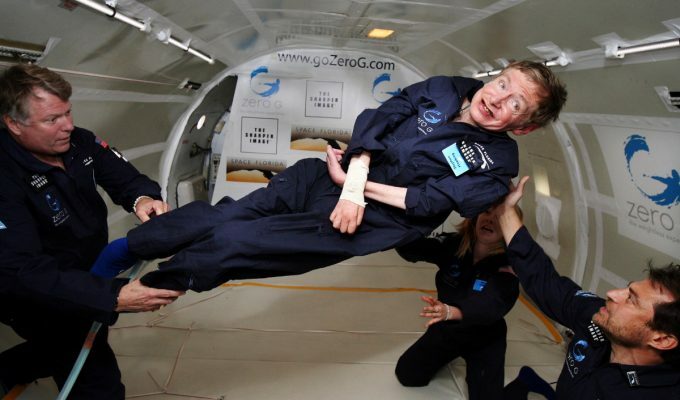 When I met him in 2007, after he was flying on the parabola aircraft, the zero-g aircraft, to get little doses of weightlessness, which is an extraordinary thing when you think about his condition, but he wasn’t willing to say, I can’t do that. And there were people there that were willing to help him do that. And, at that time, I marveled at his ability to deal with disability. Seven years later, I lost my arm, and one of the great examples I thought of as I brought myself back from that was Stephen Hawking. If a person who can’t move a muscle and can’t speak can figure out how to live a meaningful, fulfilling life an share his passion with the world, why can’t I? So, you know, Stephen Hawking, wherever you are, I thank you. Is there — kind of in that longer arc of science, there are just a few names that start to pop out. And in this particular case, around this disease, we all kind of know it as Lou Gehrig’s disease, even though I never watched Lou Gehrig play baseball. And I’m wondering, over time, whether we’re going to see this as Stephen Hawking disease, because there were so many more people on this planet that know about his condition because of what he had to suffer through. Well, for a newer generation, it probably is, for all intents and purposes, Stephen Hawking disease. When you think about that diagnosis, what a horrible diagnose that would be. The ALS Association says most people are gone within two, maybe five years. Ten percent live beyond or to 10 years. He lived many decades, I mean, way off the charts. How did that happen? How do we know? But maybe — maybe his passion and his desire to have a meaningful life had something to do with it. He published, beyond just the sort of “Brief History of Time,” which, as he would say, was a dense book to read, right, but he became an unlikely popularizer of science. So much a part of the pop culture, really. This is a man who appeared on “Star Trek” and “The Simpsons,” among other things, and was able to trade one-liners on late-night TV. He reveled in it. When I met him, it was quite clear to me — I was there with a CNN crew at the time — it was quite clear to me he really enjoyed being in the limelight and sharing his passion for science, but also just purely enjoying the fact that he was engaged in the world, despite all the limitations he seemed to have. All right, Miles O’Brien, thanks so much.